An upscale home in an upscale community! South-facing enclosed pool with forest-preserve behind it, the villa is located in the new Emerald Island Resort. Guests are welcome to use the resort clubhouse with a games room, an internet pc room, fitness room, sauna, and playground. Up to 14 people can stay in this home. The house borders a protected wooded preserve instead of the common back-to-back arrangement. Any closer to Disney and you'll need a Park Pass! Less than 2 miles and only 5 minutes and 3 traffic signals away, you save at least 40 minutes of driving per day compared to those "close" locations that have you battle traffic for 25-55 minutes each way! 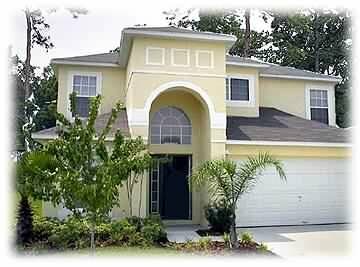 This 6 bedroom/3.5 bath vacation home has the features that experienced visitors require. TWO master en-suite bedrooms give more privacy for one large family or groups with more than one set of adults. Up to 14 people can stay in this home. The house borders a protected wooded preserve instead of the common back-to-back arrangement. 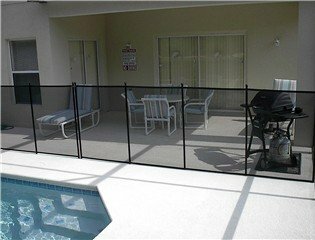 The screened southern-exposure pool enjoys year-round sun. Beautifully furnished. The first master bedroom is downstairs, the second master and the others are located upstairs. A stunning split staircase leads the way! Two bedrooms have double twin beds for the kids and are Disney-themed as part of our child-friendly environment. The interactive Disney furnishings will amuse and add to the vacation experience. The house features 5 cable TV's, 2 VCR's, DVD, Disney videos, stereo, PlayStation 2 with games, and toys for the children. There is no charge for the cot/crib, highchair, and a gas BBQ by the pool. The villa is located in the new Emerald Island Resort. Guests are welcome to use the resort clubhouse with a games room, an internet pc room, fitness room, sauna, and playground. 24hr/day care is provided by a local management company. The house is fully stocked with linens, and normal cleaning of the home after your departure is included in the weekly rate.